In BaNES we have Partners and Community Together (PACT) meetings. The last one was dominated by people demanding what the police are doing about pavement cycling. The simple answer is to give Cyclists their own space. There is a picture that has done the rounds recently about a street in Amsterdam comparing the 1970s shot next to one taken recently. It’s subtle to notice, but there is no pavement cycling in the recent picture. 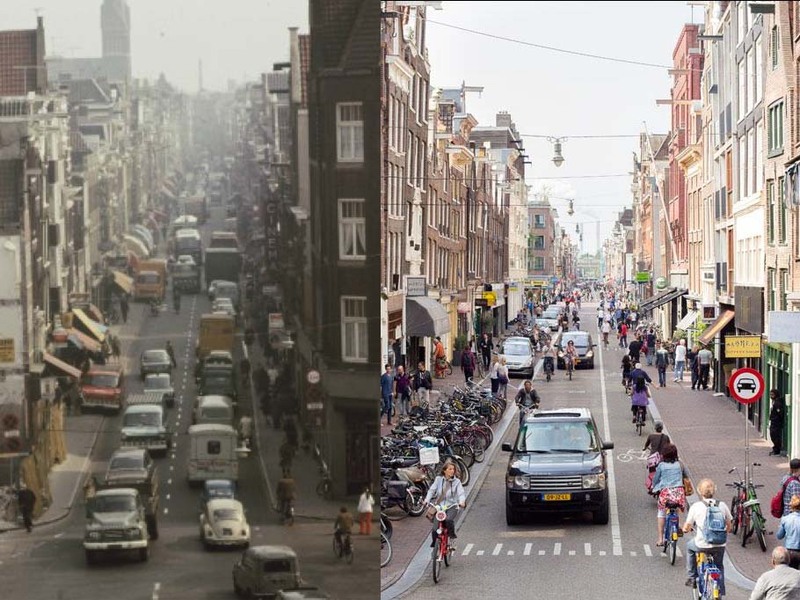 Amsterdam Street 1970s vs now. Note the pavement cycling in the picture on the left. On the right, note wider pavements and no pavement cycling. 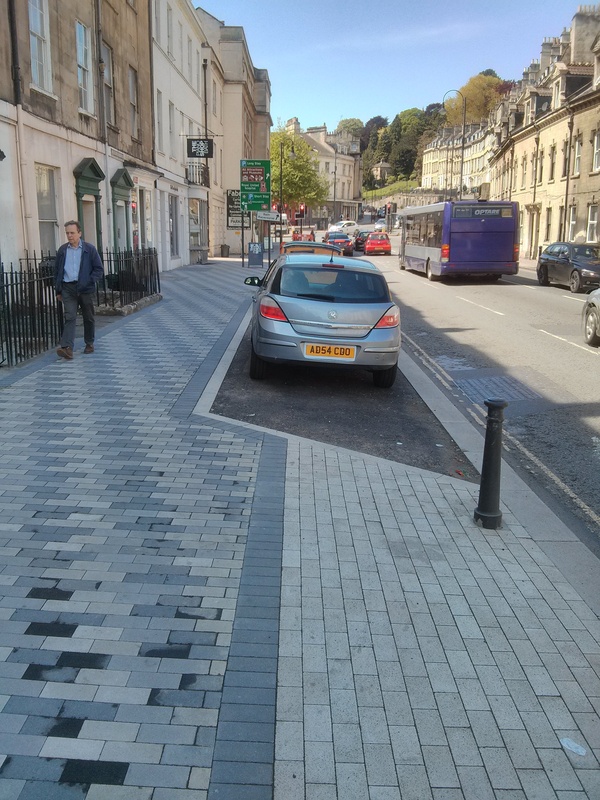 So when you sit in a PACT meeting and demand something is done about those illegal pavement cyclists, you really need to be writing to your councillors and asking them why they allow council officers to deliver schemes like Radstock or London Road or Lower Borough Walls. These schemes design in shared space with dismount signs or awkward cycle paths with loading bays or a shared path between a fast food place and a set of benches. These officers get people cycling on pavements. 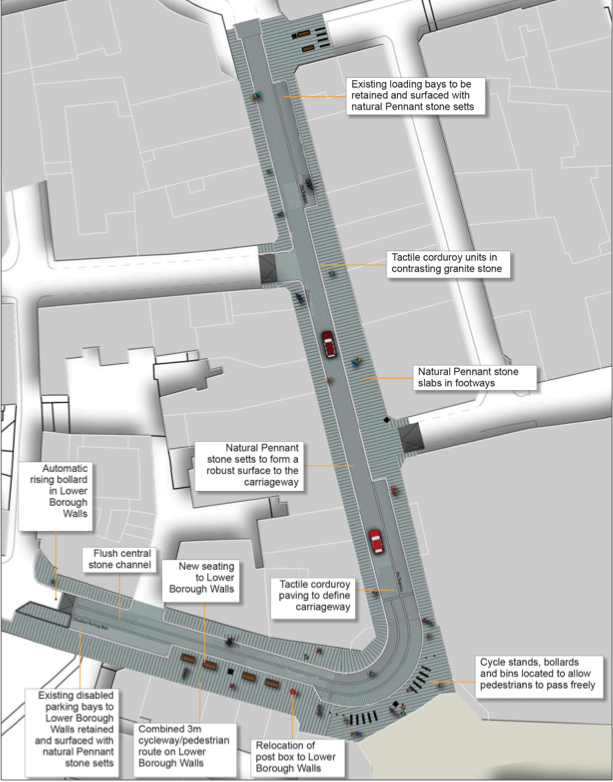 These officers design spaces where cyclists buzz past you as you are walking along. No bus stop bypasses. Cyclists should dismount if they feel they cannot confidently take the road. “Cyclists Dismount” sign is advisory. 30 minute loading bay interrupts cycle track and forces dangerous interaction between cyclists and pedestrians. Lower Borough Walls and Stall Street street plan. 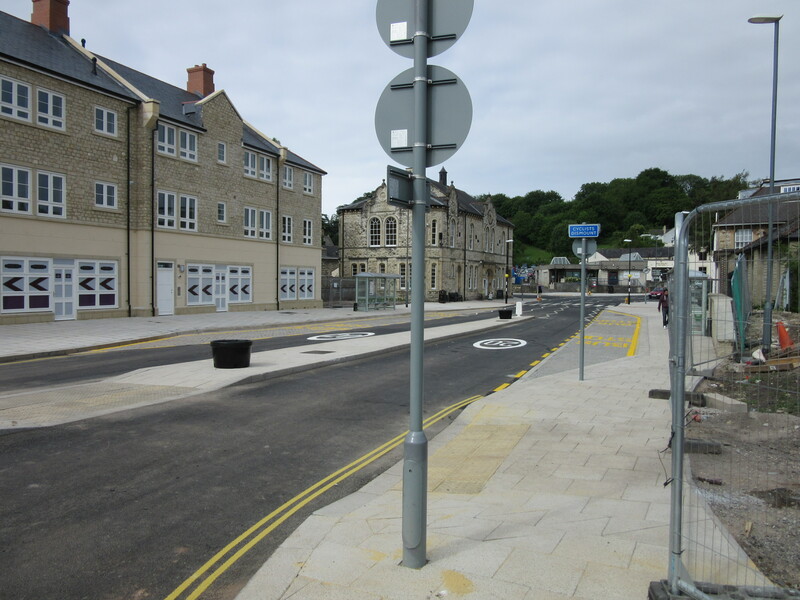 Note combined 3m cycleway/pedestrian route between the pasty shop and the new seating. Lower Borough Walls showing proposed cycleway/pedestrian shared path in red and existing cycle path in blue. You will get pavement cycling while you let your councillors and council officers prioritise motorised vehicles over any other form of transport. While they think “shared space” is ok. YOU need to persuade them it isn’t acceptable. More importantly, you cannot ignore the elephant in the room. Cycling is increasing. In BaNES 1 in 5 people cycle monthly. 39,312 people get on their bike monthly, an extra 8,017 in ONE year. There has been a 70% increase in the number that cycle 3 times per week, or an extra 4914 people decided to use their bike more. It is only going to get “worse”! Would I let a 7 year old cycle on that road? If the answer is no, then write to your councillor. It is not that I excuse pavement cycling and I particularly hate reckless pavement cycling, but it is the design of the road that encourages pavement cycling. To solve it we really need to give cyclists their own space. We need to segregate pedestrians from cyclists from cars. Nothing else will do. Nothing else will stop pavement cycling. This is a letter I sent to my councillors regarding an incident the other day. The other day I came out of Co-Op on Wellsway. I noted two people ride up Holloway then ride onto the pavement at Co-Op (I had to step aside) and ride along Wellsway from Co-Op up to the pedestrian crossing point at Kipling Avenue, cross over and head down Bloomfield Road towards the Two Tunnels. I recognise they should not have been riding on the pavement, but I also recognise that if a child could not safely cycle from Holloway to the Two Tunnels via the Bearflat Wellsway road layout, neither should I expect unconfident cyclists to do the same. Please can you look into this, and in particular, whether a segregated route for cycling from Holloway to the Two Tunnels is achievable. I do not enjoy having to negotiate pavements with cyclists. Previous PostSeeing differently: active travel revisited – changing the conversationNext PostShock tactics in canal towpath campaign.